We’ve all seen images comparing the size of Earth with that of other planets in the solar system. The problem, John Brady of Astronomy Central realized, is that these images assume a grasp of Earth’s scale. So Brady decided to do something different and compare astronomical objects with pieces of the planet his readers may be familiar with. Suddenly, with the huge continent of North America dwarfed by Jupiter’s storms, the universe seems an even larger place. In the other direction, Mars looks so much more human-scaled. John Brady/Astronomy Central. 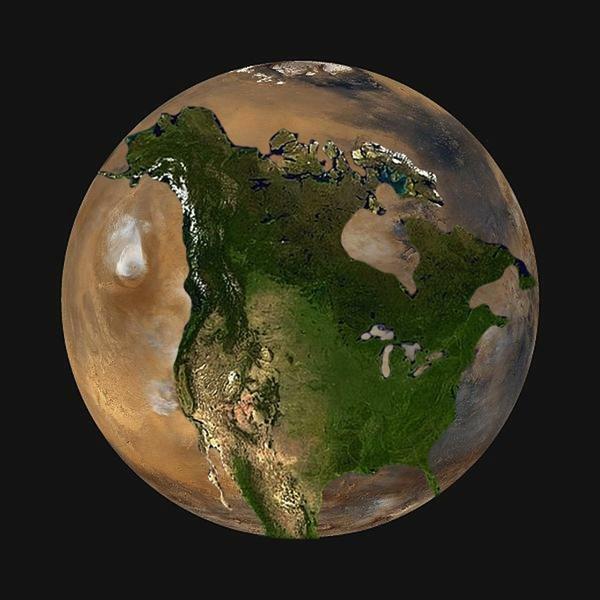 How the U.S. and Canada would measure up to Mars. Brady has also reversed the process, showing what the solar system’s largest mountain, Olympus Mons, would look like if it replaced the Grand Canyon as Arizona’s prime tourist attraction. At 26 kilometers (85,000 ft) high, it would truly be a wonder, since the Earth’s greater gravity restricts mountains to a third of that size or less. John Brady/Astronomy Central. If located appropriately, Olympus Mons would cover the whole state of Arizona. Not everything makes us feel small. If you live in Liverpool, UK, you might be tempted to go for a bike ride around the area that Brady shows would be encompassed by a neutron star, or make an equivalent image for your own home with the help of satellite photos. John Brady/Astronomy Central. Neturon stars really are the size of a city.